Hydro One reports that a force of more than 1,200 men and women worked through the holiday weekend to restore power across the region and many parts of south-western and central Ontario as a result of the intense ice storm. At the height of the crisis, the utility reported nearly 10,500 Orangeville-area customers out of power. The Alliston area was hit even harder, with 13,666 customers without power. All told, freezing rain that started last Thursday and continued overnight, caused outages affecting over 105,000 Hydro One customers. Broken poles, wires and tree branches, as well as further damaging high winds resulted in massive power outages throughout the area. On Friday, the Town of Orangeville put out a press release commending staff who “worked throughout the night to maintain the main roads and respond to reports of fallen branches and trees.” The Public Works Department reported a couple of town wells running on back-up generators and assured residents that work crews were clearing debris, sanding and salting. Citizens were warned that some streets could not be salted as residents had parked their vehicles on the road to avoid falling tree limbs. Older streets such as Amanda and Wellington could not be treated due to dangerously low-hanging Hydro lines. The Town reported widespread outages in Orangeville in multiple pockets of two to 40 homes. Citizens were told crews would focus on single-home issues, such as wires down in back yards, once pocket areas had been restored. Acting Fire Chief Ron Morden advised residents not to use propane barbecues or generators indoors and not to leave candles unattended. Despite the warnings, the Fire Department responded to about 50 calls Thursday night and continued to respond to emergency calls throughout the weekend. Hydro One helicopters were dispatched to patrol power lines and survey storm damage to prioritize the restoration effort. “Freezing rain, sleet and snow caused widespread damage in a number of the communities we serve,” said Jon Rebick, Vice President, Lines and Forestry, Hydro One in a press release. Shelburne CAO said that Emergency Management was initiated Thursday and they continued to monitor the situation until full recovery. By Friday around 2:25 p.m., north of Main Street had received power. South of Main waited through Saturday for power to resume when Hydro One crews returned to repair major damaged areas. A warming centre was set up Saturday at the Mel Lloyd Centre and was converted to a shelter for some residents. Mr. Telfer reported significant tree loss in all areas of Town and said cleanup continued Saturday with tree cleanup having taken most of Friday by all available crews and contractor workers. About 20 hydro lines came down in the storm with many being repaired in town throughout the long weekend. As of late Sunday evening, parts of the Mulmur and Melancthon townships and the Town of Mono were still facing another possible two days without power, with Hornings’ Mills mostly restored. In Terra Nova, where 20 forestry crews worked to clean up trees, it was predicted that power would be up and running on Monday. Pam Hillock, Clerk for the County of Dufferin reported several roads closed in Mono during the weather crisis, including 5th Line at Highway 9, the Mono-Amaranth Town Line between County roads 10 and 16, 15 Sideroad between Blind Line and Mono/Amaranth Town Line, 3rd Line between County 8 and 25 Sideroad as well as the 3rd Line from Hockley Road to Highway 89. As of Sunday evening some parts of the Hockley Valley were reported to still be two days out from receiving power. High winds and heavy rains that fell Monday continued to be a threat to already fragile trees. Residents were reminded, that even as temperatures rise and melt the ice, the danger of falling ice and branches continues. It is important to continue to be watchful and aware. At 1:27 p.m. Wednesday, the Hydro One Storm Centre reported that crews were still working at two Dufferin locations, one in north Amaranth and the other in Mono near Camilla. In each case up to 50 customers were still without power. With power restored elsewhere, the big remaining challenge is cleanup. Dufferin County issued a press release Wednesday asking residents to be patient while clean-up efforts progress within each local municipality. Yard waste will be collected in Orangeville during the week of April 4th (Week A). During the following week, yard waste will be collected in the urban areas of Grand Valley and Shelburne, as well as in rural subdivisions (Week B). Rural subdivisions include Brookfield, Brookhaven Crescent, Campbell Road, Cardinal Woods, Grand View Road, Island Lake, Kingfisher Drive, Madill Drive, Purple Hill, Rayburn Meadows, Robinson Road, Starrview Crescent, Sylvanwood Estates, Village Green and Waldemar. Residents in all other rural areas of Dufferin must call 1.888.941.3345 ext. 1 to be added to the collection list for the week of April 25th. For a map of the yard waste schedule and collection areas, visit dufferincounty.ca/waste. Yard waste set out to the curb for this collection must be no longer than 1.25m (4 feet) long, and in bundles no heavier than 20 kg (44 pounds). For more information regarding the yard waste program, residents can contact Dufferin County Waste Services at dufferinwaste@dufferincounty.ca or 519-941-2816 ext. 2620. Dufferin County is also offering to cover the cost for residents to bring ice storm debris to the GFL Dufferin Transfer Station at 473051 Dufferin Road 11, Amaranth, until Saturday, April 16. Branches and brush brought down by the ice storm will be accepted free of charge for residents who provide photo ID with a Dufferin County address. This is being offered to residents and is not intended for commercial loads or vehicles. Branches and brush will be mulched and/or composted. 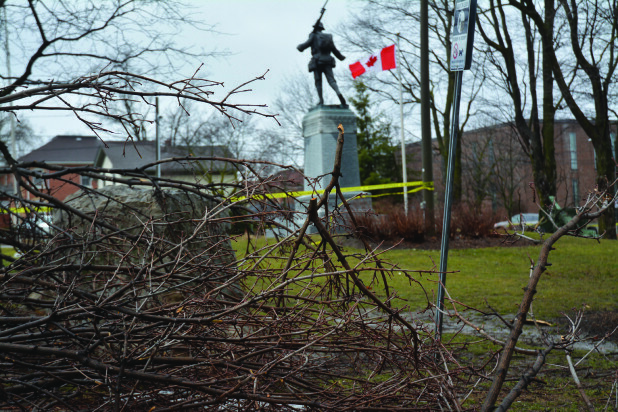 The County says residents should contact their local municipality or visit local municipal websites for specific information on how each municipality is addressing clean-up of branches and brush brought down by the ice storm. The Town of Orangeville’s Fire, Public Works and Parks crews, along with Orangeville Hydro crews, have been busy responding to issues related to the storm. Clean-up efforts are continuing this week. By Tuesday the Town’s staff and contractor had covered approximately 30 percent of the Town. The Town had received approximately 150 calls to date with respect to downed trees and branches on municipal property. “If you require immediate assistance from the Public Works Department, or wish to report a downed tree on the road or sidewalk, please contact the Operations Centre at 519-941-9124 Ext. 4500, the after-hours call centre at 519-941-2671 or email info@orangeville.ca. Work on tree damage along Mill Creek will start next week and is expected to take some time, particularly between Wellington and Mill Streets. Later this spring an arborist will assess trees in Town to determine if damaged trees should come down from a safety perspective. Residents are reminded to be careful walking near trees which may have branches or limbs weakened by the ice storm and to always stay 10 metres back from downed power lines. All of Orangeville Hydro’s customers were affected by the storm. The duration of the power outages customers experienced ranged from 30 seconds to 42 hours. Orangeville Hydro has had to replace one pole and one transformer. The rest of the storm damage is requiring Orangeville Hydro to replace a significant number of service wires and service connections. Orangeville Hydro had more than 200 calls regarding wires down and trees on wires. By Tuesday morning, they had reduced the list to 40 outstanding tree issue locations. Customers are still urged to call Orangeville Hydro regarding wires down and trees on lines. Orangeville Hydro crews have assisted in Dufferin County, the Town of Caledon, and the Township of Wellington North. Hydro One crews from Niagara, Ottawa and Burlington have been in the area around Town, working with the local Hydro One crews to restore power to thousands of rural people affected by the storm. You can monitor the Town of Orangeville’s website at www.orangeville.ca for up-to-date information and follow tips on Facebook and Twitter. Nothing lasts forever, and that includes stately trees. Caledon residents Paul and Debby Ross learned about that during last week’s ice storm. In the end, the storm had claimed a sugar maple on their Mountainview Road property. They say the tree had stood at least 200 years. Mrs. Ross said she saw the tree was covered with ice at about 6:30 a.m Friday morning, adding it broke, with half of it coming down at about noon. She added it did not come down in silence. “Crack, and then boom,” she recalled. “The ground shook as it was coming down,” Mr. Ross added. The tree, which was designated as a heritage tree in Caledon, had a diameter of about three feet. Mr. Ross estimated it was about 100 feet tall. The Rosses live in a pioneer homestead which was owned by a Major Potter. It was built in 1817, and he said that as near as can be determined, it originally stood north of the tree. The house was later moved further back on the lot, and then finally placed at its current location, south of the tree, in 1967. Mr. Ross added that the property is under forest management. Part of the tree is still standing, but Mr. Ross said he was not optimistic about its future. Despite its age, he said the tree was covered with leaves every year.